Small - Holds about 4 oz. OUTSIDE MEASUREMENTS: 3" x 5-5/8"
INSIDE MEASUREMENTS: 2-1/4" x 4-1/4"
Medium - Holds about 8 oz. OUTSIDE MEASUREMENTS: 3-7/8" x 7-1/2"
INSIDE MEASUREMENTS: 2-7/8" x 6-1/4"
Large - Holds about 1 lb. OUTSIDE MEASUREMENTS: 4-1/2" x 10"
INSIDE MEASUREMENTS: 3-1/2" x 8"
I ordered the set and followed the directions given by the second reviewer in the comment section. I did everything she said. I cured the molds with oil, set them in ice cold water while making my butter, placed the finished product in the freezer for a good half hour and when it was ready, gently knocked the butter out of the mold onto a flat surface. It came out perfect and gorgeous. The wood molds are great quality and the designs are very pretty! Love my new butter molds! I purchased the medium size rectangular butter mold about a year ago and have been using it ever since. I love it! I did learn by trial and error the best way for me to use it. Like cast iron, if not properly seasoned, it will have issues. When I first received my butter mold, I oiled it with the food grade mineral oil as was recommended and then soaked it for 30 minutes with cool tap water before filling it with butter. I put it in the refrigerator overnight but it didn't un-mold very well the next day. I coated it with oil again and then tried the soaking method I now use. What I found that works for me is it to fill the mold cavity with ice cubes, place it in a pan, and fill the pan and mold with ice water until it barely floats in the pan. I let it soak for at least 30 minutes or longer while washing my butter. Once the butter is ready I pour out the excess water from the butter mold, but do NOT dry it out, then fill it with my freshly washed butter which is usually very soft. I cover it with plastic wrap and put it in the freezer. Like a cake, it's ready when the butter pulls away from the sides. The butter doesn't just fall out of the mold. It has to be tapped it on the counter to pop it out. Usually the mold gets immediately put back into ice water for the next batch of butter. However, if the mold sits out to dry for days or gets scrubbed too clean between uses the butter will stick in the decorative carving. To prevent that, I simply coat with oil before using again and then follow with the ice water soak before filling it with fresh butter. I've found that it works great! I too had trouble getting the butter out until friends told me to freeze it. I did so overnight, and with tapping it with a small wooden mallet the butter popped right out. Give i a shot, it's darling! By the way, I have the round one not shown here, but wanted to share that it is possible to really use them. I filled mine all the way to the top, it looks great, not perfect, but great! I did not like the butter mold. It is very pretty but the butter did not want to drop out once chilled. I even tried sticking it in the freezer. 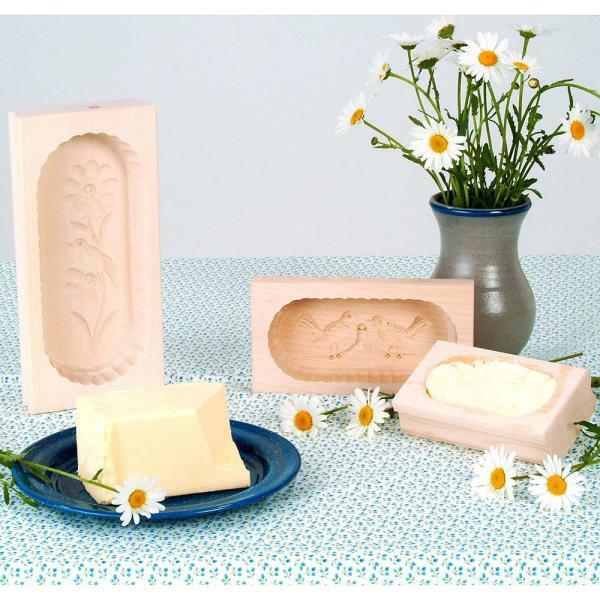 The butter molds are beautiful -- real works of art!